So I’m going share a “Kelly Moment with” you. A long time ago, in a galaxy far way I was a 19-year-old who decided become a vegetarian. I started by declaring to my friends that I was going to stop eating beef and only eat chicken and fish. That all went well until I went to the local diner and order chicken fried steak and after I had polished it off, my friend Tora asked me how the beef tasted. Yeah. I totally did that and it goes to show how little I knew about food at that time. 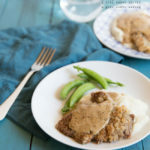 Paleo Chicken Fried steak has been on my to do list for a while and this recipe is the perfect gluten-free indulgence. A tip: Eat this hot out of the pan. If you try to leave this on warm in the oven the bottom of it will get a little, well, gooey. In a skillet over medium heat add the bacon grease. Combine the tapioca flour, sea salt and garlic powder in a paper bag and shake to combine. Crack the two large eggs into a large bowl and beat. Take the cubbed steak and, piece by piece, dip the steak in the flour mixture, then place in the egg wash and place back into the flour mixture for a final coat. Place the coated steak in the bacon grease and fry until golden brown, roughly 4 -5 minutes per side and flip and repeat. Once all the steaks have been fried, place the HWC or coconut milk into the pan and whisk with the drippings until you have a gravy, roughly 1 minute. Yum, chicken fried steak is one of my favorite indulgent comfort meals. Nothing better. Add some potatoes and veggies and I am in heaven. Now that looks totally amazing! This looks yummy! I would love to try it! Great tip on serving it immediately. It looks really, really good! I love chicken fried steak. This looks great. THAT LOOKS SO TASTY!! I HAVE TO TRY THIS RECIPE! This sounds like a great recipe for our post-vacation diet! Southern comfort food done right! I’ve never had chicken-fried steak and wasn’t even sure what it was but that looks intriguing! This paleo chicken fried steak looks delicious. I will have to try it soon. It was so good! I didn’t have any tapioca flour, so I used a mix of almond meal and arrowroot starch, and it worked great. I used coconut milk for the gravy, which was a little thin, but arrowroot starch thickened it up like a charm. Even my meat-and-potatoes, junk-food loving husband liked it. Glad to know I can still make a roux like my mama taught me, even if I’m cooking paleo. 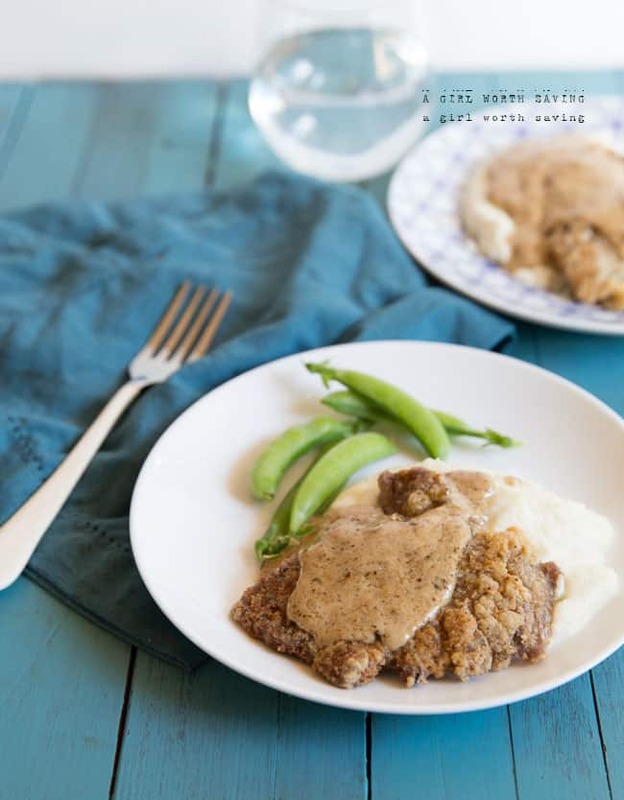 We enjoyed the chicken fried steak but when it had come time to make the gravy, I added the cream to the bacon grease and whisked immediately and what I got was a bunch of little white pieces floating around in the bacon grease. Where did I go wrong? If you used coconut cream, you prolly just needed to heat the mixture in the pan for a bit. Wow this is so good! I made it for dinner, exactly as written. I used coconut milk for the gravy and it was perfect. Never thiught to use coconut milk for gravy before, will definitely be doing that again. Thanks for the yummy recipe! I’m glad you enjoyed it hun! I have made this multiple times since finding your recipe. I have used everything from arrowroot, tapioca, to buckwheat flour for the breading. My daughter doesn’t like to eat meat but this is the dish she is asking for for her birthday dinner. I have found that of all the paleo recipes out there…I come to your site first. I love the foods you love apparently. You have a gift! Aw, Jennifer <3 Thanks so much for the sweet note hun and I'm so glad you all enjoyed it! I made this for dinner tonight. I served it with sweet potatoes and a salad. It was very good! Thank you for the recipe. There was just the right amount of flour, egg, and gravy. The only thing I changed was Kerry gold butter for bacon grease. I would recommend recommend cooking it right away instead of stacking the floured pieces on a plate. Mine stuck together and some didn’t have breading. The ones on the bottom of the plate didn’t have any on the bottom either. It is hot here so I don’t know if that made the difference. Yum! So glad you enjoyed it Barbara! Hi, I have even looking for a paleo chicken fried steak recipe and am happy to say that my search is over! I made this last night and my husband told me at least 4 times how good it was. Super easy and quick too. Your recipes are consistently spot on. Thank you for sharing. I’m so glad that you enjoyed it Laura! This was FANTASTIC! And very doable for a large family in a hurry to eat. Thank you so much!!! Will definitely keep this on the frequently used recipe list! As a side note, my family likes thick creamy gravy, so I mixed 2 t. of guar gum into the oil drippings and then added the milk/cream after. Delicious, thick, rich gravy. For those who do not have bacon grease, you can substitute avocado oil instead of butter because it will not have the tendency to burn that butter has. Yeah! I love this dish too Julie! Hi! I am on the AIP Paleo diet and cannot have eggs. Would dipping in coconut milk first work? Or even brushing with some avocado oil before coating with flour? Thanks! yep, the coconut milk would work hun. We love your recipe for chicken fried steak! We’ve made several grain free versions but yours is the best and a 5 star…my kids really enjoy it! Great taste except the gravy. Bacon grease/cream gravy was a bit heavy and greasy tasting, unsurprisingly. – coconut flour worked fine without imparting too much of its flavor. – for my stove and my skillet at medium heat, 4-5 min./side was too much; cube steak got a bit overcooked. – I skimped on the bacon fat amount in the recipe because I was only cooking one steak, but this left me with precious little gravy. Don’t skimp on the fat! And as an added bonus, I won’t need to eat until dinner! Hello from Texas! Thanks for sharing your recipe! I made it today. My husband is allergic to tapioca so I used an arrowroot/coconut flour combo and it turned out really good. He liked the gravy the best. We’ve been following a very strict autoimmune diet/protocol for the past 6 months. We are starting to miss some of our pre-AIP foods so it was such a treat to eat chicken fried steak without deviating from our plan. Thank you so much! So glad you both enjoyed it Allison! Excellent! I used skinless boneless chicken breast (pounded slightly; not very much – just to make is a little thinner) instead of cube steak. Also, I used 1/2 cup tapioca flour with 1/2 cup crushed macadamia and walnuts instead of the full cup tapioca flour. For the gravy, I used Nutpods original flavor. So very good!